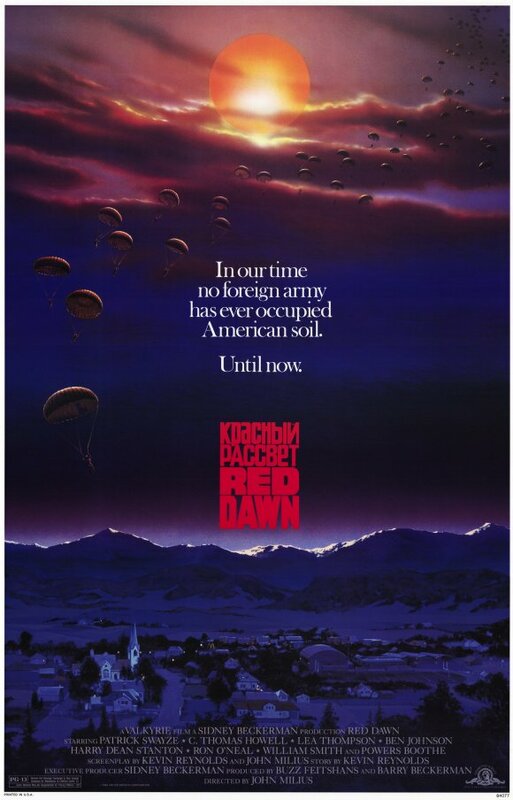 Red Dawn. Valkyrie Films 1984. Even in the 80s, as the cold war thawed, open warfare between the US and Soviet Union seemed likely. However, apparently it seemed plausible that a Soviet invasion could be resisted by guerrilla teens, so fear of the red menace was probably eroding. I’m finding it interesting to track depictions of the Enemy over the decades. I know the 90s had trouble giving up the Soviets as stock villains, but I haven’t previously noticed a shift in how Russia was treated before the breakup. It’s often just a looming shadow of calamity, like an anvil held over one’s head with a fraying rope. Here, however, is a take on what happens when the rope snaps. In a small Colorado town, Cuban/Soviet paratroopers suddenly land outside the local high school. A small handful of teens escape the invasion and manage to collect supplies and weapons before fleeing to the woods. They lie in hiding for a month until the shooting stops and then reemerge to find that their home is occupied territory, 40 miles behind the stagnated front line. Trying to survive outside the communist regime, they soon begin operating “Wolverines!” guerrilla resistance against the occupying forces. Fighting a war they never asked for takes its toll on the whole band of kids, but weighs most heavily on assumed leader Jed. I had always understood this movie to be rah-rah American sticktuitiveness is indomitible, and there is an element of that, but it’s also much bleaker than my impression. The invasion occurs almost immediately after the movie begins, which gave the impression it was going to be wall to wall action mayhem, but then once they’ve made it to safety, it skips over a month and goes in to explore the calm. I’d thought they were repelling an invasion in a matter of days, not an occupation in a matter of months, which sets a very different tone. As the months wear on, casualties rise and spirits fall, with the exception of the occasional battle to a smooth victory, which still comes with the cost of reprisals against civilians. Eventually, reality does ensue, and the communist forces learn how to properly combat guerrilla resistance. I don’t see this as all that conservative a film. Early on, there’s a shot of a “you can have my gun when you pry it from my cold, dead hands” bumper sticker, panning over to the soldier standing over the car’s owner and doing just that. Gun ownership doesn’t save anybody. The bad guys have bigger, better guns. The good guys make trouble for them by using their less powerful weapons more intelligently. Certainly, the wide open spaces of small town Colorado have people better equipped for survival than the big cities, but that’s not political, that’s practical. The relatively graphic depiction of war and the emotional toll it takes seem fairly liberal, but then there may have been a political shift since the mid 80s. The arc I appreciated the most wasn’t with the kids, it was the Cuban colonel commanding the occupation under his Soviet superiors. He’s uncomfortable with his position from the beginning because he’s only had experience being a revolutionary, and now he’s fighting on the side of power. At one point he tries to suggest working on getting the support of the people, but he’s shot down because America used that strategy in Vietnam and lost, but he’s right. Without the support of the governed, a new government cannot take hold without having some resistance somewhere. The kids occasionally ask themselves what the difference is between “us and them”, and one of the answers offered is “we live here”. The occupying forces don’t have as much at stake as the locals, and according to the movie, that is why they will lose. It’s also why a land war on US (or USSR) soil is such an implausible idea that the movie has to have many paragraphs of justification for it. In order for the US to be isolated enough for communist powers to dream of an invasion, communist revolutions have to happen throughout the rest of Latin America, including Mexico, and Europe has to vote in noninterventionist parties, dissolving NATO. And then the Soviets have to be driven to desperation by a failed grain harvest. Much like The Day After or The Andromeda Strain, the point seems to be less about why as “what would it look like if this terrible thing happened?” And then what plot there is grows out of that. I thought I’d enjoy this movie more than I did. Or rather, I thought it would be a more enjoyable story than it was. There may be guns and explosions, but nobody talks about the grisly casualties and reprisals or the way the oppression and violence grind down the protagonists. For some reason people seem to remember it as The Goonies meets Stripes or something, when it goes much more into the psychological effects than most of the best-received war films. It’s like I saw a completely different movie from everyone else. While it wasn’t what I was sold, I did appreciate the complexity and found it to be more worth the time than the feel-good patriotism I expected.